Is India – the country which Sathya Sai Baba said would lead the world into a “Golden Age” of prolonged peace and well-being – well-justified? Certainly, India escalates its nuclear armament preparations, including long-range nuclear missiles with multiple warhead capacity, and development (especially hand-in-hand with Russia and France) of a nuclear flotilla. Sathya Sai Baba – at whose feet fell countless Indians at the highest levels right across India’s power structure (including PM Manmohan Singh, pictured at Right – said that India, after having accepted his Divine Lordship, would lead the world into a ‘ Golden Age’ of peace and social well-being. “Very soon, the entire world will be united. In fact, after 28 years, the world itself will become ‘Bharat’. Everyone will call themself a Bharatiya (one imbued with godliness — Bhagavat rathas). No one will refer to themself as belonging to this state or that state, this region or that region.” (from Sathya Sai Baba’s Convocation Discourse 22-11-2008 at http://www.sathyasai.org/discour/2008/d081122.html). Sathya Sai Baba said that India, with him as the driver, would be, so to speak, the locomotive, with all the other countries, like carriages, coming behind. Instead of a smooth ride, we shall all have to hang onto our hats! India now has an ICBM (Inter Continental Ballistic Missile) capability, having successfully tested the Agni V. Its delivery loads have a long reach, including Chinese cities. This nuclear weapon is (Agni 3), precedes the latest Indian ICBM, a MIRV, Agni 5 – a Multiple Independently Targetable Reentry Vehicle. Also: Multiple Independently Targeted Reentry Vehicle, Multiple Independent Reentry Vehicle. “Any of several nuclear warheads carried on the front end of a ballistic missile. The technique allows separately targeted nuclear warheads to be released from the missile on different trajectories, thus attacking several targets from only one launcher. MIRVed ballistic missiles were first deployed by the U.S. and then the Soviet Union in the 1970s, followed by Britain and France in the 1980s and possibly China in the 1990s. Because multiple warheads represent a significant increase in firepower, they have often been an issue in arms control negotations. The Strategic Arms Reduction Talks commit both the U.S. and Russia to limit the number of MIRVs on some missiles”. Defense writers report that India’s multiple warheads point at key parts of China. China-sponsored Pakistan’s counterpoise to the Agni V is the Shaheen 1A which can carry up to 100 nuclear warheads. Last year India spent (US) 49 billion on defense, and is the world’s biggest arms buyer. It has an indigenous nuclear-powered submarine, and is sourcing others from abroad, and burgeoning nuclear supportive naval power. China, too, greatly extends its defense spending. In a which-came-first, chicken-or-egg scenario, it hardly matters who initiates a difficulty. Both chook and egg are going to get badly smashed. India – now firmly enjoined with the USA-led Western Alliance (including nuclear-armed Britain, France, Russia, Israel) – fast-orchestrates strategies to preëmpt or to match. This, despite all of these countries’ political and diplomatic sweet talk that these counterweights are not meant with China in mind. Especially from the 60’s many of the dropped-out ‘Hippy Generation’, along with other spiritual seekers – disabused with materialism whether capitalist or communist – looked to India (and other parts of the East) as a light in a dark and frightening world. Often, the hopes of the seekers reposed in the likes of Paramahansa Sri Rama Krishna, Vivekanananda and the Ramakrishna Mission, Meha Baba, Ramana Maharshi, Paramahansa Yogananda, Sivananda and the Divine Light Mission, Neem Karoli Baba, Muktananda, and a great many others from India – the millennial land of avatars, gurus, mahouts, mahants, mahatmas, swamis, etc. Indian educated classes, like the villagers, often have, alike, long bowed low to all these. As one who lived lengthily in India both around Sathya Sai Baba, and well beyond, I can attest to how daily and typical it was, and is, to find Indian politicians of practically all stripes bowing low to the ‘holy’ men and women. The often pompous and florid speeches proclaim the spiritual glories of India, but the practice is truly abysmal – and, just as daily and typically, steeped in corruption, toxic as the spit from cobra fangs. In India, I was a guest in high places and in hovels, and found, at all levels – not even exempting the still often sweetly naïve forest tribals among whom I at one time worked, who knew too well of the way e.g., the police and other dark forces worked at the behest of the evil and powerful timber logging companies – almost universal despair at generations of corruption in the country’s leadership. New Delhi; April 19,2012: Today India launched it’s first Inter-Continental Ballistic Missile(ICBM), called the “Agni-V”. 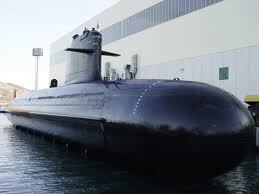 The missile was launched from Wheeler Islands in the Indian State of Odisha (Formerly known as Orissa). The missile was developed by the Defense Research and Development Organization (DRDO). It took about four years to develop this missile, which has the capability to reach strike targets well beyond 5,500 km. The Agni-V can also carry nuclear warheads up-to 1.1 tons. This successful launch has allowed India to join the elite group of nations which possess far-reaching nuclear rocket technology, including the United States, China, Russia, Great Britain and France. 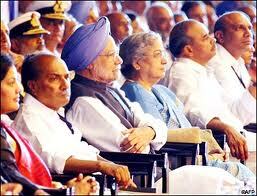 Indian Prime Minister Dr Manmohan Singh described the Agni-V test as a major milestone in India’s military power. Indian defense minister A.K. Antony congratulated DRDO chief Dr. V.K. Saraswat, stating that the “immaculate success” of the Agni-5 is a major milestone in the country’s missile research and development program. The Agni-V test was conducted using a rail mobile launcher. The missile took about 15 minutes to reach the designated target point, more than 5,000 kilometers away in the Indian Ocean. The missile was to be launched on Wednesday, but the test had to be postponed due to poor weather conditions. Agni-V is about 17.5 m long and weighs 50,000 kilograms, and was developed with a budget of about 2,500 crore rupees. Among other reasons, there is a much less reported reason for the success – at a very deep and far-reaching level – of the former Sathya Sai Baba devotees’ long and gruelling exposure in some of the world’s leading media, the UN, etc., of Sathya Sai Baba and his worldwide cult. This success drew the response from non-Sai devotee family members, friends, neighbors, and school, college, university, professional, trade and other and associates of devotees. It also drew a strong interest from many government, civic, legal, religious and other institutions. Profoundly blinded devotees would not hear a word said against their idol. He was God walking the earth. He could do as he pleased. One had to love him for his mystery. And not question his plethora of outright contradictions, failed prophecies and promises of healing or giving places in his colleges or university or apartments in the ashram, etc. They would not listen to the heart-wrenching testimony of the parents and boys and young men from many countries whom Sathya Sai Baba sexually abused. They were utterly remiss in refusing all proper and normative processes of moral and legal accountability. We have powerful and repeated well-documented evidence of Sathya Sai Organization leaders turning away the many parents and others who have gone to them in great distress with their shocking accounts of Sai Baba’s sexual abuse of their boys and young men and, sometimes, by a small number of his college and university teachers. The organization’s history of ignoring the allegations is truly appalling. Sorely afflicted families from many countries have verified the Sathya Sai Organizations profound failure of duty of care and accountability and transparency. The media, scholars, police and other institutions have attested the extreme resistance of the cult to investigation. Top world media have observed this imperviousness and obfuscation, including: BBC, CBC (Canada), DR (Denmark), Salon.com (USA), SBS (all television), ABC (Radio Australia). In paper media – Times of London, Daily Telegraph, Guardian (UK), Marie Claire Magazine, Salon.com,BT, Bild, Focus, Trouw, Speegelbield, Noordhollands Dagblad, Sokaren, Gatopardo, Ottawa Citizen, Toronto Star, Vancouver Sun, Age, Australian Financial Review, West Australian (a major front page article by an award-winning journalist (Torrance Mendez) was pulled at the 11th hour! ), Adelaide Advertiser, etc., …..
For the international Sathya Sai Organization, and for Sai devotees en masse, reason and commonsense stood for naught, much less ordinary human compassion. There was utterly cruel shunning of their former colleagues and friends, often of many years standing, whom they had, for every good reason, previously held in high regard. Overnight, as it were, we transformed into devils. History can only deliver a harsh judgement of those members at all levels of the Sathya Sai Organization who spurned those who, with great pain and difficulty spoke forth the shocking facts which they, around the world, increasingly uncovered – broadly speaking from about 1999. They deserted their constantly iterated principles of: Truth, Right Conduct, Spiritual Love and Peace and (in a few cases, resorted to violence – a legal case about more recent – and most terrible – examples is now underway). These readers had an invaluable asset: Their independence. For they were not caught up in the trammels of one of history’s biggest and far-reaching cults. Is Indian ‘Godman’ Sai Baba’s Moon Waning Still Further? 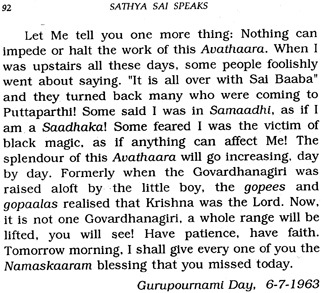 It is interesting to find highly unofficially-officially connected prominent Sathya Sai Baba devotees, including those who as students were long in his colleges and university, now enthusing about visions in the moon of their guru. That some get so extremely excitable as to support calls on the Internet for people’s experiences of Sathya Sai Baba induced moon visions, suggests that Sai Baba’s years of education have failed them. (Yes, by the way, their education was ‘free’ but many of their parents forked out a fortune in donations and supposedly incidental expenses). Unless, of course, a moon vision of Sai Baba – when, as it turned out, clouds heavily obscured the moon!!! – is one of his greatest miracles. “it so happens that the moon on October 23 was not full but was still ’waxing gibbous’, as can be seen from the following image taken from the astronomical website http://stardate.org/nightsky/moon/ This shows the moon two days before full moon. Full moon did not occur until Oct 26 04:52, according to NASA“. 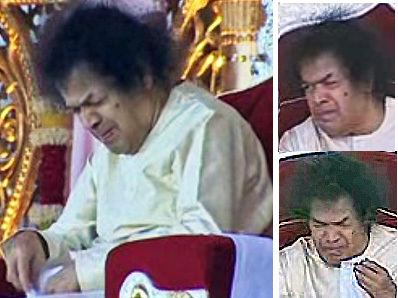 Every now and then major examples of Sathya Sai Baba’s worsening mental physical decrepitude would – quite enormously – aid us in far more widely establishing our good credentials in exposing him and his cult. We, whom the Sai forces went to great lengths to make seem mad and bad, were all too validly, and often sadly, exposing a terrible madness. The madness of the human mind in the grip of an extremely powerful charismatic cult. He often and foolishly equated young romantic love with later, mature love in relationships. In doing so, he did constant dirt against the kind of marriage my own wonderful parents had, along with so many others in so many cultures. Today, in tribute to Motherhood, I wrote a lyric. I have long noticed how so many mothers pass themselves off, in self-diminishment, as “just a mother”. For inspiration, I used an instrumental piece of music by Sir Karl Jenkins, the great contemporary British composer: ‘Children of Dannu’. What would you like to be in life? No matter how much Sathya Sai Baba’s devotee’s may like to deny his many downputs about women, he was severely misogynistic. He held a yearly ‘Ladies Day’, but his discourses and behaviour on this and many other occasions show that he often did not, where it counts, honor them. His international Sathya Sai Organization is to this day extremely chauvinistic and male-dominated. Like many of his beliefs, it is as though, in crucial respects, no sociocultural sea changes had ever happened. Throughout the decades, he famously ignored the women’s side of the darshan. A welter of evidence from around the world helps to make sense of this. For, in the grip of a powerful attraction to boys and young men, he was forever scanning for victims for his homosexual lust (while, of course, forever preaching against lust). Many times, he disparaged partners, sometimes forcing them to split. To this day, partners who stay together are deeply struck at how he mistaken he was in the nasty characteristics which, in interviews and sometimes darshan, he attributed to them.